1.Mail received from Regional Education Institution, Dated: 28. 07.2017. While enclosing a copy of brochure received from the Regional Education of Institution ,Azmeer. 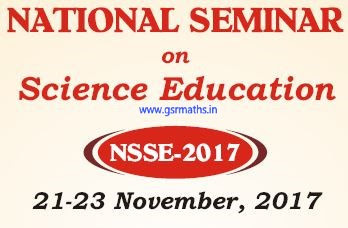 In the reference 1st read above, the research papers are invited from Science teachers, faculty of DIETs, CTEs, IASEs & SCERTs pertaining to the theme "Science Education". The last date for submission of abstracts is 30.09.2017.
requested to take necessary action in the matter.